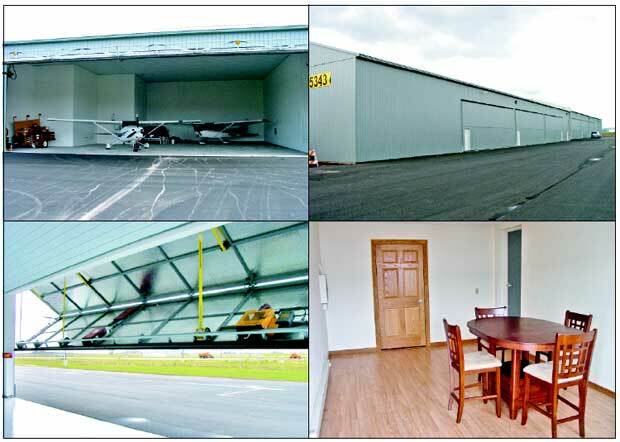 Aircraft Storage Solutions, LLC offers condominium hangars with many of the comforts of home or office. Each condo is equipped with a Schweiss bifold door. How many bedrooms? That was the most frequently asked question from almost everyone who heard of the condominium hangars being constructed at Outagamie County Regional Airport (ATW) in Appleton, Wis. It took a little explaining that the "condos" were condominiums for airplanes. Aircraft Storage Solutions, LLC as developer, planned, built and is now selling condominium hangars at ATW. The development is spearheaded by Jim Uher, a retired Air Wisconsin captain. Uher had long thought that there was a need for hangar space at ATW which provided amenities not available in a municipal hangar, such as heat, water and bathroom facilities. In the spring of 2005 he organized a group of four like-minded pilots including himself. Besides Uher, the group consists of Patrick Spillane, a retired technical college teacher, Wayne Schmidt, a builder, and Thomas Janssen, an attorney. The group formed Aircraft Storage Solutions, LLC to be the developer and commenced negotiations with Outagamie County. 3. When a total of 10 of the T-hangars are sold, the condominium building will be managed by the Condominium Association. With the agreement in place, construction began in early November of 2005. The building was completed in July of 2006. As of September 1, 2006, 10 of the 14 T-hangar units have been sold. All hangars have water, floor drains and separately metered gas and electric utilities. All units are separately insulated from one another. The building is long, 468 feet, so it was decided to place the toilet facilities and flight room in the center (lengthwise) of the building. These facilities are accessible at the center of the building from both sides. This was compatible with the building design, which required a masonry fire wall through the center of the building. The flight room and bathroom facilities are located adjacent to the fire wall. There are eight similar sized hangars of 1,363 sq. ft. The firewall through the center of the building breaks up the continuity of "nesting" of the T-hangars and as a result, the four hangars near the center of the building are larger in size ranging from 1,472 ft. to 1,600 ft. The eight similar sized hangars and the four larger hangars near the center of the building all have 44' Schweiss Bifold Doors. On each end are two large hangars, with 58-foot doors built to accommodate large twins and small corporate jets. Each of these hangars is 3,120 sq. ft. and is configured for an office and a bathroom. Prices for the condos range from $46,900.00 for the smallest to $106,900.00 for the largest. Estimated total cost of operating the building is $3,000.00 annually. The largest single element of cost is building insurance. Units will be assessed a condominium fee which will be based on each units proportionate floor space compared to the floor space of the entire building. For the small units, this amounts to about 6-7% of the total operating costs. The developers are anxious to repeat their success at other airports. For additional information contact Jim Uher at (920) 277-5343. This story provided courtesy of Midwest Flyer Magazine.